Sarah Catharine Boyd (1842-1911) was the daughter of Thomas R. Boyd and Sarah Elizabeth Butler. In the 1850 census they were living in District 18, Buena Vista, Carroll County. Thomas Boyd was a farmer. In 1864 Sarah became the second wife of farmer Phillip T. Butler; he was most likely a cousin. The couple had two children together and five from Philip’s first marriage. Sarah died of pneumonia on Nov. 20, 1911, just ten days after her husband died. They are buried in Oak Grove Cemetery, Carroll County. Thread loss in the last digit of the date has rendered it illegible. Sarah was probably attending a dame school when she made her sampler. 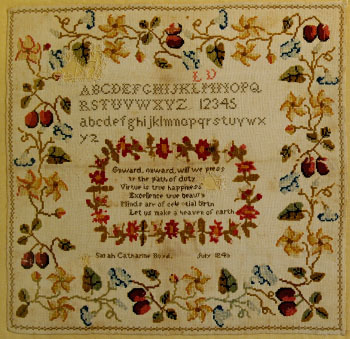 The sampler indicates that she was a skilled stitcher at a young age.